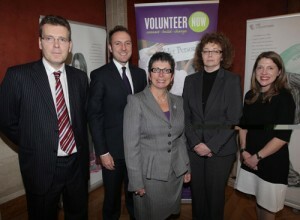 Dr. Pat McCloughan was delighted to attend and address the recent event hosted by Volunteer Now (6 Dec 2011) held in the Long Gallery at Stormont in Belfast to celebrate the end of the European Year of Volunteering (2011). L-R: Dr. Pat McCloughan; Chris Lyttle MLA; Wendy Osborne OBE, CEO Volunteer Now; Caral Ni Chuilin MLA, Minister for Culture, Arts and Leisure; and Yvonne McKenna, CEO Volunteer Ireland. Dr. McCloughan presented an overview of the findings of the recently published Eurofound study on participation in volunteering and unpaid work activities in the EU27 (available here) and talked about the opportunities for continuing the emphasis on voluntary activities in 2012, in the context of the European Year of Active Ageing. Dr. McCloughan’s address in Belfast follows an earlier presentation he gave in Brussels (hosted by the EU-funded Applica Social Situation Observatory) on the theme of ‘Unpaid Work and Volunteering in the Context of Active Ageing’ (29 Nov 2011) (presentations available here).